For other uses, see Orchestra (disambiguation). An orchestra (/ˈɔːrkɪstrə/; Italian: [orˈkɛstra]) is a large instrumental ensemble typical of classical music, which combines instruments from different families, including bowed string instruments such as the violin, viola, cello, and double bass, brass instruments such as the horn, trumpet, trombone and tuba, woodwinds such as the flute, oboe, clarinet and bassoon, and percussion instruments such as the timpani, bass drum, triangle, snare drum and cymbals, each grouped in sections. Other instruments such as the piano and celesta may sometimes appear in a fifth keyboard section or may stand alone, as may the concert harp and, for performances of some modern compositions, electronic instruments. A full-size orchestra may sometimes be called a symphony orchestra or philharmonic orchestra. The actual number of musicians employed in a given performance may vary from seventy to over one hundred musicians, depending on the work being played and the size of the venue. The term chamber orchestra (and sometimes concert orchestra) usually refers to smaller-sized ensembles of about fifty musicians or fewer. Orchestras that specialize in the Baroque music of, for example, Johann Sebastian Bach and George Frideric Handel, or Classical repertoire, such as that of Haydn and Mozart, tend to be smaller than orchestras performing a Romantic music repertoire, such as the symphonies of Johannes Brahms. The typical orchestra grew in size throughout the 18th and 19th centuries, reaching a peak with the large orchestras (of as many as 120 players) called for in the works of Richard Wagner, and later, Gustav Mahler. Orchestras are usually led by a conductor who directs the performance with movements of the hands and arms, often made easier for the musicians to see by use of a conductor's baton. The conductor unifies the orchestra, sets the tempo and shapes the sound of the ensemble. 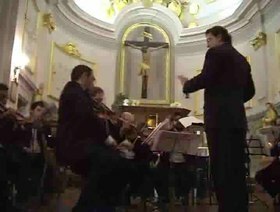 The conductor also prepares the orchestra by leading rehearsals before the public concert, in which the conductor provides instructions to the musicians on their interpretation of the music being performed. The leader of the first violin section, commonly called the concertmaster, also plays an important role in leading the musicians. In the Baroque music era (1600–1750), orchestras were often led by the concertmaster or by a chord-playing musician performing the basso continuo parts on a harpsichord or pipe organ, a tradition that some 20th century and 21st century early music ensembles continue. Orchestras play a wide range of repertoire, including symphonies, opera and ballet overtures, concertos for solo instruments, and as pit ensembles for operas, ballets, and some types of musical theatre (e.g., Gilbert and Sullivan operettas). Amateur orchestras include those made up of students from an elementary school or a high school, youth orchestras, and community orchestras; the latter two typically being made up of amateur musicians from a particular city or region. The term orchestra derives from the Greek ὀρχήστρα (orchestra), the name for the area in front of a stage in ancient Greek theatre reserved for the Greek chorus. Stokowski and the Philadelphia Orchestra at the March 2, 1916 American premiere of Mahler's 8th Symphony. The invention of the piston and rotary valve by Heinrich Stölzel and Friedrich Blühmel, both Silesians, in 1815, was the first in a series of innovations which impacted the orchestra, including the development of modern keywork for the flute by Theobald Boehm and the innovations of Adolphe Sax in the woodwinds, notably the invention of the saxophone. These advances would lead Hector Berlioz to write a landmark book on instrumentation, which was the first systematic treatise on the use of instrumental sound as an expressive element of music. The next major expansion of symphonic practice came from Richard Wagner's Bayreuth orchestra, founded to accompany his musical dramas. Wagner's works for the stage were scored with unprecedented scope and complexity: indeed, his score to Das Rheingold calls for six harps. Thus, Wagner envisioned an ever-more-demanding role for the conductor of the theatre orchestra, as he elaborated in his influential work On Conducting. This brought about a revolution in orchestral composition, and set the style for orchestral performance for the next eighty years. Wagner's theories re-examined the importance of tempo, dynamics, bowing of string instruments and the role of principals in the orchestra. As the early 20th century dawned, symphony orchestras were larger, better funded, and better trained than ever before; consequently, composers could compose larger and more ambitious works. The influence of Gustav Mahler was particularly innovational; in his later symphonies, such as the mammoth Symphony No. 8, Mahler pushes the furthest boundaries of orchestral size, employing huge forces. By the late Romantic era, orchestras could support the most enormous forms of symphonic expression, with huge string sections, massive brass sections and an expanded range of percussion instruments. With the recording era beginning, the standards of performance were pushed to a new level, because a recorded symphony could be listened to closely and even minor errors in intonation or ensemble, which might not be noticeable in a live performance, could be heard by critics. As recording technologies improved over the 20th and 21st centuries, eventually small errors in a recording could be "fixed" by audio editing or overdubbing. Some older conductors and composers could remember a time when simply "getting through" the music as best as possible was the standard. Combined with the wider audience made possible by recording, this led to a renewed focus on particular star conductors and on a high standard of orchestral execution. The typical symphony orchestra consists of four groups of related musical instruments called the woodwinds, brass, percussion, and strings. Other instruments such as the piano and celesta may sometimes be grouped into a fifth section such as a keyboard section or may stand alone, as may the concert harp and electric and electronic instruments. The orchestra, depending on the size, contains almost all of the standard instruments in each group. In the history of the orchestra, its instrumentation has been expanded over time, often agreed to have been standardized by the classical period and Ludwig van Beethoven's influence on the classical model. In the 20th and 21st century, new repertory demands expanded the instrumentation of the orchestra, resulting in a flexible use of the classical-model instruments and newly developed electric and electronic instruments in various combinations. The terms symphony orchestra and philharmonic orchestra may be used to distinguish different ensembles from the same locality, such as the London Symphony Orchestra and the London Philharmonic Orchestra. A symphony orchestra will usually have over eighty musicians on its roster, in some cases over a hundred, but the actual number of musicians employed in a particular performance may vary according to the work being played and the size of the venue. Chamber orchestra usually refers to smaller-sized ensembles; a major chamber orchestra might employ as many as fifty musicians; some are much smaller than that. The term concert orchestra may also be used, as in the BBC Concert Orchestra and the RTÉ Concert Orchestra. The so-called "standard complement" of doubled winds and brass in the orchestra from the first half of the 19th century is generally attributed to the forces called for by Beethoven. The composer's instrumentation almost always included paired flutes, oboes, clarinets, bassoons, horns and trumpets. The exceptions to this are his Symphony No. 4, Violin Concerto, and Piano Concerto No. 4, which each specify a single flute. Beethoven carefully calculated the expansion of this particular timbral "palette" in Symphonies 3, 5, 6, and 9 for an innovative effect. The third horn in the "Eroica" Symphony arrives to provide not only some harmonic flexibility, but also the effect of "choral" brass in the Trio movement. Piccolo, contrabassoon, and trombones add to the triumphal finale of his Symphony No. 5. A piccolo and a pair of trombones help deliver the effect of storm and sunshine in the Sixth, also known as the Pastoral Symphony. The Ninth asks for a second pair of horns, for reasons similar to the "Eroica" (four horns has since become standard); Beethoven's use of piccolo, contrabassoon, trombones, and untuned percussion—plus chorus and vocal soloists—in his finale, are his earliest suggestion that the timbral boundaries of symphony might be expanded. For several decades after his death, symphonic instrumentation was faithful to Beethoven's well-established model, with few exceptions. Apart from the core orchestral complement, various other instruments are called for occasionally. These include the flugelhorn and cornet. Saxophones and classical guitars, for example, appear in some 19th- through 21st-century scores. While appearing only as featured solo instruments in some works, for example Maurice Ravel's orchestration of Modest Mussorgsky's Pictures at an Exhibition and Sergei Rachmaninoff's Symphonic Dances, the saxophone is included in other works, such as Ravel's Boléro, Sergei Prokofiev's Romeo and Juliet Suites 1 and 2, Vaughan Williams' Symphonies No.6 and 9 and William Walton's Belshazzar's Feast, and many other works as a member of the orchestral ensemble. The euphonium is featured in a few late Romantic and 20th-century works, usually playing parts marked "tenor tuba", including Gustav Holst's The Planets, and Richard Strauss's Ein Heldenleben. The Wagner tuba, a modified member of the horn family, appears in Richard Wagner's cycle Der Ring des Nibelungen and several other works by Strauss, Béla Bartók, and others; it has a prominent role in Anton Bruckner's Symphony No. 7 in E Major. Cornets appear in Pyotr Ilyich Tchaikovsky's ballet Swan Lake, Claude Debussy's La Mer, and several orchestral works by Hector Berlioz. Unless these instruments are played by members "doubling" on another instrument (for example, a trombone player changing to euphonium or a bassoon player switching to contrabassoon for a certain passage), orchestras typically hire freelance musicians to augment their regular ensemble. The 20th-century orchestra was far more flexible than its predecessors. In Beethoven's and Felix Mendelssohn's time, the orchestra was composed of a fairly standard core of instruments, which was very rarely modified by composers. As time progressed, and as the Romantic period saw changes in accepted modification with composers such as Berlioz and Mahler; some composers used multiple harps and sound effect such as the wind machine. During the 20th century, the modern orchestra was generally standardized with the modern instrumentation listed below. Nevertheless, by the mid- to late 20th century, with the development of contemporary classical music, instrumentation could practically be hand-picked by the composer (e.g., to add electric instruments such as electric guitar, electronic instruments such as synthesizers, non-Western instruments, or other instruments not traditionally used in orchestra). With this history in mind, the orchestra can be analysed in five periods: the Baroque era, the Classical music period, early/mid-Romantic music era, late-Romantic/early 20th century music and 21st century era. The first is a Baroque orchestra (i.e., J.S. Bach, Handel, Vivaldi), which generally had a smaller number of performers, and in which one or more chord-playing instruments, the basso continuo group (e.g., harpsichord or pipe organ and assorted bass instruments to perform the bassline), played an important role; the second is a typical classical period orchestra (e.g., early Beethoven along with Mozart and Haydn), which used a smaller group of performers than a Romantic music orchestra and a fairly standardized instrumentation; the third is typical of an early/mid-Romantic era (e.g., Schubert, Berlioz, Schumann); the fourth is a late-Romantic/early 20th century orchestra (e.g., Wagner, Brahms, Mahler, Stravinsky), to the common complement of a 2010-era modern orchestra (e.g., Adams, Barber, Aaron Copland, Glass, Penderecki). Among the instrument groups and within each group of instruments, there is a generally accepted hierarchy. Every instrumental group (or section) has a principal who is generally responsible for leading the group and playing orchestral solos. The violins are divided into two groups, first violin and second violin, with the second violins playing in lower registers than the first violins, playing an accompaniment part, or harmonizing the melody played by the first violins. The principal first violin is called the concertmaster (or "leader" in the UK) and is not only considered the leader of the string section, but the second-in-command of the entire orchestra, behind only the conductor. The concertmaster leads the pre-concert tuning and handles musical aspects of orchestra management, such as determining the bowings for the violins or for all of the string section. The concertmaster usually sits to the conductor's left, closest to the audience. There is also a principal second violin, a principal viola, a principal cello and a principal bass. The principal trombone is considered the leader of the low brass section, while the principal trumpet is generally considered the leader of the entire brass section. While the oboe often provides the tuning note for the orchestra (due to 300-year-old convention), no principal is the leader of the woodwind section though in woodwind ensembles, often the flute is leader. Instead, each principal confers with the others as equals in the case of musical differences of opinion. Most sections also have an assistant principal (or co-principal or associate principal), or in the case of the first violins, an assistant concertmaster, who often plays a tutti part in addition to replacing the principal in his or her absence. A section string player plays in unison with the rest of the section, except in the case of divided (divisi) parts, where upper and lower parts in the music are often assigned to "outside" (nearer the audience) and "inside" seated players. Where a solo part is called for in a string section, the section leader invariably plays that part. The section leader (or principal) of a string section is also responsible for determining the bowings, often based on the bowings set out by the concertmaster. In some cases, the principal of a string section may use a slightly different bowing than the concertmaster, to accommodate the requirements of playing their instrument (e.g., the double-bass section). Principals of a string section will also lead entrances for their section, typically by lifting the bow before the entrance, to ensure the section plays together. Tutti wind and brass players generally play a unique but non-solo part. Section percussionists play parts assigned to them by the principal percussionist. In modern times, the musicians are usually directed by a conductor, although early orchestras did not have one, giving this role instead to the concertmaster or the harpsichordist playing the continuo. Some modern orchestras also do without conductors, particularly smaller orchestras and those specializing in historically accurate (so-called "period") performances of baroque and earlier music. The most frequently performed repertoire for a symphony orchestra is Western classical music or opera. However, orchestras are used sometimes in popular music (e.g., to accompany a rock or pop band in a concert), extensively in film music, and increasingly often in video game music. Orchestras are also used in the symphonic metal genre. The term "orchestra" can also be applied to a jazz ensemble, for example in the performance of big-band music. In the 2000s, all tenured members of a professional orchestra normally audition for positions in the ensemble. Performers typically play one or more solo pieces of the auditionee's choice, such as a movement of a concerto, a solo Bach movement, and a variety of excerpts from the orchestral literature that are advertised in the audition poster (so the auditionees can prepare). The excerpts are typically the most technically challenging parts and solos from the orchestral literature. Orchestral auditions are typically held in front of a panel that includes the conductor, the concertmaster, the principal player of the section for which the auditionee is applying, and possibly other principal players. The most promising candidates from the first round of auditions are invited to return for a second or third round of auditions, which allows the conductor and the panel to compare the best candidates. Performers may be asked to sight read orchestral music. The final stage of the audition process in some orchestras is a test week, in which the performer plays with the orchestra for a week or two, which allows the conductor and principal players to see if the individual can function well in an actual rehearsal and performance setting. There are a range of different employment arrangements. The most sought-after positions are permanent, tenured positions in the orchestra. Orchestras also hire musicians on contracts, ranging in length from a single concert to a full season or more. Contract performers may be hired for individual concerts when the orchestra is doing an exceptionally large late-Romantic era orchestral work, or to substitute for a permanent member who is sick. A professional musician who is hired to perform for a single concert is sometimes called a "sub". Some contract musicians may be hired to replace permanent members for the period that the permanent member is on parental leave or disability leave. Historically, major professional orchestras have been mostly or entirely composed of male musicians. The first female members hired in professional orchestras have been harpists. The Vienna Philharmonic, for example, did not accept women to permanent membership until 1997, far later than comparable orchestras (the other orchestras ranked among the world’s top five by Gramophone in 2008). The last major orchestra to appoint a woman to a permanent position was the Berlin Philharmonic. In February 1996, the Vienna Philharmonic's principal flute, Dieter Flury, told Westdeutscher Rundfunk that accepting women would be "gambling with the emotional unity (emotionelle Geschlossenheit) that this organism currently has". In April 1996, the orchestra’s press secretary wrote that "compensating for the expected leaves of absence" of maternity leave would be a problem. In 1997, the Vienna Philharmonic was "facing protests during a [US] tour" by the National Organization for Women and the International Alliance for Women in Music. Finally, "after being held up to increasing ridicule even in socially conservative Austria, members of the orchestra gathered [on 28 February 1997] in an extraordinary meeting on the eve of their departure and agreed to admit a woman, Anna Lelkes, as harpist." As of 2013, the orchestra has six female members; one of them, violinist Albena Danailova, became one of the orchestra’s concertmasters in 2008, the first woman to hold that position. In 2012, women made up 6% of the orchestra's membership. VPO president Clemens Hellsberg said the VPO now uses completely screened blind auditions. In 2013, an article in Mother Jones stated that while "[m]any prestigious orchestras have significant female membership—women outnumber men in the New York Philharmonic's violin section—and several renowned ensembles, including the National Symphony Orchestra, the Detroit Symphony, and the Minnesota Symphony, are led by women violinists", the double bass, brass, and percussion sections of major orchestras "...are still predominantly male." A 2014 BBC article stated that the "...introduction of ‘blind’ auditions, where a prospective instrumentalist performs behind a screen so that the judging panel can exercise no gender or racial prejudice, has seen the gender balance of traditionally male-dominated symphony orchestras gradually shift." School orchestras: These orchestras consist of students from an elementary or secondary school. They may be students from a music class or program or they may be drawn from the entire school body. School orchestras are typically led by a music teacher. University or conservatory orchestras: These orchestras consist of students from a university or music conservatory. In some cases, university orchestras are open to all students from a university, from all programs. Larger universities may have two or more university orchestras: one or more orchestras made up of music majors (or, for major music programs, several tiers of music major orchestras, ranked by skill level) and a second orchestra open to university students from all academic programs (e.g., science, business, etc.) who have previous classical music experience on an orchestral instrument. University and conservatory orchestras are led by a conductor who is typically a professor or instructor at the university or conservatory. Youth orchestras: These orchestras consist of teens and young adults drawn from an entire city or region. The age range in youth orchestras varies between different ensembles. In some cases, youth orchestras may consist of teens or young adults from an entire country (e.g., Canada's National Youth Orchestra). Community orchestras: These orchestras consist of amateur performers drawn from an entire city or region. Community orchestras typically consist mainly of adult amateur musicians. Community orchestras range in level from beginner-level orchestras which rehearse music without doing formal performances in front of an audience to intermediate-level ensembles to advanced amateur groups which play standard professional orchestra repertoire. In some cases, university or conservatory music students may also be members of community orchestras. While community orchestra members are mostly unpaid amateurs, in some orchestras, a small number of professionals may be hired to act as principal players and section leaders. Orchestras play a wide range of repertoire ranging from 17th-century dance suites, 18th century divertimentos to 20th century film scores and 21st-century symphonies. Orchestras have become synonymous with the symphony, an extended musical composition in Western classical music that typically contains multiple movements which provide contrasting keys and tempos. Symphonies are notated in a musical score, which contains all the instrument parts. The conductor uses the score to study the symphony before rehearsals and decide on their interpretation (e.g., tempos, articulation, phrasing, etc. ), and to follow the music during rehearsals and concerts, while leading the ensemble. Orchestral musicians play from parts containing just the notated music for their instrument. A small number of symphonies also contain vocal parts (e.g., Beethoven's Ninth Symphony). Orchestras also perform overtures, a term originally applied to the instrumental introduction to an opera. During the early Romantic era, composers such as Beethoven and Mendelssohn began to use the term to refer to independent, self-existing instrumental, programmatic works that presaged genres such as the symphonic poem, a form devised by Franz Liszt in several works that began as dramatic overtures. These were "at first undoubtedly intended to be played at the head of a programme". In the 1850s the concert overture began to be supplanted by the symphonic poem. Orchestras also play with instrumental soloists in concertos. During concertos, the orchestra plays an accompaniment role to the soloist (e.g., a solo violinist or pianist) and, at times, introduces musical themes or interludes while the soloist is not playing. Orchestras also play during operas, ballets, some musical theatre works and some choral works (both sacred works such as Masses and secular works). In operas and ballets, the orchestra accompanies the singers and dancers, respectively, and plays overtures and interludes where the melodies played by the orchestra take centre stage. In the Baroque era, orchestras performed in a range of venues, including at the fine houses of aristocrats, in opera halls and in churches. Some wealthy aristocrats had an orchestra in residence at their estate, to entertain them and their guests with performances. During the Classical era, as composers increasingly sought out financial support from the general public, orchestra concerts were increasingly held in public concert halls, where music lovers could buy tickets to hear the orchestra. Aristocratic patronage of orchestras continued during the Classical era, but this went on alongside public concerts. In the 20th and 21st century, orchestras found a new patron: governments. Many orchestras in North America and Europe receive part of their funding from national, regional level governments (e.g., state governments in the U.S.) or city governments. These government subsidies make up part of orchestra revenue, along with ticket sales, charitable donations (if the orchestra is registered as a charity) and other fundraising activities. With the invention of successive technologies, including sound recording, radio broadcasting, television broadcasting and Internet-based streaming and downloading of concert videos, orchestras have been able to find new revenue sources. One of the "great unmentionable [topics] of orchestral playing" is "faking", the process by which an orchestral musician gives the "...impression of playing every note as written", typically for a very challenging passage that is very high or very fast, while not actually playing the notes that are in the printed music part. An article in The Strad states that all orchestral musicians, even those in the top orchestras, occasionally "fake" certain passages. One reason that musicians "fake" is because there are not enough rehearsals. Another factor is the extreme challenges in 20th century and 21st century contemporary pieces; professionals interviewed by the magazine said "faking" was "...necessary in anything from ten to almost ninety per cent of some modern works. Professional players who were interviewed were of a consensus that faking may be acceptable when a part is not written well for the instrument, but faking "just because you haven’t practised" the music is not acceptable. With the advent of the early music movement, smaller orchestras where players worked on execution of works in styles derived from the study of older treatises on playing became common. These include the Orchestra of the Age of Enlightenment, the London Classical Players under the direction of Sir Roger Norrington and the Academy of Ancient Music under Christopher Hogwood, among others. In the United States, the late 20th century saw a crisis of funding and support for orchestras. The size and cost of a symphony orchestra, compared to the size of the base of supporters, became an issue that struck at the core of the institution. Few orchestras could fill auditoriums, and the time-honored season-subscription system became increasingly anachronistic, as more and more listeners would buy tickets on an ad hoc basis for individual events. Orchestral endowments and—more centrally to the daily operation of American orchestras—orchestral donors have seen investment portfolios shrink or produce lower yields, reducing the ability of donors to contribute; further, there has been a trend toward donors finding other social causes more compelling. While government funding is less central to American than European orchestras, cuts in such funding are still significant for American ensembles. Finally, the drastic falling-off of revenues from recording, tied to no small extent to changes in the recording industry itself, began a period of change that has yet to reach its conclusion. U.S. orchestras that have gone into Chapter 11 bankruptcy include the Philadelphia Orchestra (in April 2011), and the Louisville Orchestra, in December 2010; orchestras that have gone into Chapter 7 bankruptcy and have ceased operations include the Northwest Chamber Orchestra in 2006, the Honolulu Orchestra in March 2011, the New Mexico Symphony Orchestra in April 2011, and the Syracuse Symphony in June 2011. The Festival of Orchestras in Orlando, Florida ceased operations at the end of March, 2011. One source of financial difficulties that received notice and criticism was high salaries for music directors of US orchestras, which led several high-profile conductors to take pay cuts in recent years. Music administrators such as Michael Tilson Thomas and Esa-Pekka Salonen argued that new music, new means of presenting it, and a renewed relationship with the community could revitalize the symphony orchestra. The American critic Greg Sandow has argued in detail that orchestras must revise their approach to music, performance, the concert experience, marketing, public relations, community involvement, and presentation to bring them in line with the expectations of 21st-century audiences immersed in popular culture. It is not uncommon for contemporary composers to use unconventional instruments, including various synthesizers, to achieve desired effects. Many, however, find more conventional orchestral configuration to provide better possibilities for color and depth. Composers like John Adams often employ Romantic-size orchestras, as in Adams' opera Nixon in China; Philip Glass and others may be more free, yet still identify size-boundaries. Glass in particular has recently turned to conventional orchestras in works like the Concerto for Cello and Orchestra and the Violin Concerto No. 2. Along with a decrease in funding, some U.S. orchestras have reduced their overall personnel, as well as the number of players appearing in performances. The reduced numbers in performance are usually confined to the string section, since the numbers here have traditionally been flexible (as multiple players typically play from the same part). Conducting is the art of directing a musical performance, such as an orchestral or choral concert. The primary duties of the conductor are to set the tempo, ensure correct entries by various members of the ensemble, and "shape" the phrasing where appropriate. To convey their ideas and interpretation, a conductor communicates with their musicians primarily through hand gestures, typically though not invariably with the aid of a baton, and may use other gestures or signals, such as eye contact with relevant performers. A conductor's directions will almost invariably be supplemented or reinforced by verbal instructions or suggestions to their musicians in rehearsal prior to a performance. The conductor typically stands on a raised podium with a large music stand for the full score, which contains the musical notation for all the instruments and voices. Since the mid-18th century, most conductors have not played an instrument when conducting, although in earlier periods of classical music history, leading an ensemble while playing an instrument was common. In Baroque music from the 1600s to the 1750s, the group would typically be led by the harpsichordist or first violinist (see concertmaster), an approach that in modern times has been revived by several music directors for music from this period. Conducting while playing a piano or synthesizer may also be done with musical theatre pit orchestras. Communication is typically non-verbal during a performance (this is strictly the case in art music, but in jazz big bands or large pop ensembles, there may be occasional spoken instructions, such as a "count in"). However, in rehearsals, frequent interruptions allow the conductor to give verbal directions as to how the music should be played or sung. Conductors act as guides to the orchestras or choirs they conduct. They choose the works to be performed and study their scores, to which they may make certain adjustments (e.g., regarding tempo, articulation, phrasing, repetitions of sections, and so on), work out their interpretation, and relay their vision to the performers. They may also attend to organizational matters, such as scheduling rehearsals, planning a concert season, hearing auditions and selecting members, and promoting their ensemble in the media. Orchestras, choirs, concert bands and other sizable musical ensembles such as big bands are usually led by conductors. In the Baroque music era (1600–1750), most orchestras were led by one of the musicians, typically the principal first violin, called the concertmaster. The concertmaster would lead the tempo of pieces by lifting his or her bow in a rhythmic manner. Leadership might also be provided by one of the chord-playing instrumentalists playing the basso continuo part which was the core of most Baroque instrumental ensemble pieces. Typically, this would be a harpsichord player, a pipe organist or a luteist or theorbo player. A keyboard player could lead the ensemble with his or her head, or by taking one of the hands off the keyboard to lead a more difficult tempo change. A lutenist or theorbo player could lead by lifting the instrument neck up and down to indicate the tempo of a piece, or to lead a ritard during a cadence or ending. In some works which combined choirs and instrumental ensembles, two leaders were sometimes used: a concertmaster to lead the instrumentalists and a chord-playing performer to lead the singers. During the Classical music period (ca. 1720–1800), the practice of using chordal instruments to play basso continuo was gradually phased out, and it disappeared completely by 1800. Instead, ensembles began to use conductors to lead the orchestra's tempos and playing style, while the concertmaster played an additional leadership role for the musicians, especially the string players, who imitate the bowstroke and playing style of the concertmaster, to the degree that is feasible for the different stringed instruments. In 1922, the idea of a conductor-less orchestra was revived in post-revolutionary Soviet Union. The symphony orchestra Persimfans was formed without a conductor, because the founders believed that the ensemble should be modeled on the ideal Marxist state, in which all people are equal. As such, its members felt that there was no need to be led by the dictatorial baton of a conductor; instead they were led by a committee, which determined tempos and playing styles. Although it was a partial success within the Soviet Union, the principal difficulty with the concept was in changing tempo during performances, because even if the committee had issued a decree about where a tempo change should take place, there was no leader in the ensemble to guide this tempo change. The orchestra survived for ten years before Stalin's cultural politics disbanded it by taking away its funding. In Western nations, some ensembles, such as the Orpheus Chamber Orchestra, based in New York City, have had more success with conductorless orchestras, although decisions are likely to be deferred to some sense of leadership within the ensemble (for example, the principal wind and string players, notably the concertmaster). Others have returned to the tradition of a principal player, usually a violinist, being the artistic director and running rehearsal and leading concerts. Examples include the Australian Chamber Orchestra, Amsterdam Sinfonietta & Candida Thompson and the New Century Chamber Orchestra. As well, as part of the early music movement, some 20th and 21st century orchestras have revived the Baroque practice of having no conductor on the podium for Baroque pieces, using the concertmaster or a chord-playing basso continuo performer (e.g., harpsichord or organ) to lead the group. Some orchestral works specify that an offstage trumpet should be used or that other instruments from the orchestra should be positioned off-stage or behind the stage, to create a haunted, mystical effect. To ensure that the offstage instrumentalist(s) play in time, sometimes a sub-conductor will be stationed offstage with a clear view of the principal conductor. Examples include the ending of "Neptune" from Gustav Holst's The Planets. The principal conductor leads the large orchestra, and the sub-conductor relays the principal conductor's tempo and gestures to the offstage musician (or musicians). One of the challenges with using two conductors is that the second conductor may get out of synchronization with the main conductor, or may mis-convey (or misunderstand) the principal conductor's gestures, which can lead to the offstage instruments being out of time. In the late 20th century and early 21st century, some orchestras use a video camera pointed at the principal conductor and a closed-circuit TV set in front of the offstage performer(s), instead of using two conductors. The techniques of polystylism and polytempo music have led a few 20th and 21st century composers to write music where multiple orchestras or ensembles perform simultaneously. These trends have brought about the phenomenon of polyconductor music, wherein separate sub-conductors conduct each group of musicians. Usually, one principal conductor conducts the sub-conductors, thereby shaping the overall performance. In Percy Grainger's "The Warriors" which includes three conductors: the primary conductor of the orchestra, a secondary conductor directing an off-stage brass ensemble, and a tertiary conductor directing percussion and harp. One example in the late century orchestral music is Karlheinz Stockhausen's Gruppen, for three orchestras, which are placed around the audience. This way, the "sound masses" could be spacialized, as in an electroacoustic work. Gruppen was premiered in Cologne, in 1958, conducted by Stockhausen, Bruno Maderna and Pierre Boulez. It has been[when?] performed by Simon Rattle, John Carewe and Daniel Harding. ^ Hector Berlioz. Traite d'instrumentation et d'orchestration (Paris: Lemoine, 1843). ^ Richard Wagner. On Conducting (Ueber das Dirigiren), a treatise on style in the execution of classical music (London: W. Reeves, 1887). ^ See Lance W. Brunner. (1986). "The Orchestra and Recorded Sound", pp. 479–532 in Joan Peyser Ed. The Orchestra: Origins and Transformations, New York: Scribner's Sons. ^ Jack Westrup, "Instrumentation and Orchestration: 3. 1750 to 1800", New Grove Dictionary of Music and Musicians, 2nd ed., edited by Stanley Sadie (New York: Grove, 2001). ^ D. Kern Holoman, "Instrumentation and Orchestration: 4. 19th Century", in ibid. ^ G.W. Hopkins and Paul Griffiths, "Instrumentation and Orchestration: 5. Impression and Later Developments", in ibid. ^ "The Wagner Tuba". The Wagner Tuba. Retrieved 2014-06-04. ^ G.W. Hopkins and Paul Griffiths, op. cit. ^ Ford, Luan; Davidson, Jane W. (2003-01-01). "An Investigation of Members' Roles in Wind Quintets". Psychology of Music. 31: 53–74. doi:10.1177/0305735603031001323. Retrieved 2014-06-04. ^ "The world's greatest orchestras". gramophone.co.uk. 2012-10-24. Retrieved 2013-04-29. ^ "The Vienna Philharmonic's Letter of Response to the Gen-Mus List". Osborne-conant.org. 1996-02-25. Retrieved 2013-10-05. ^ Hannah Levintova. "Here's Why You Seldom See Women Leading a Symphony". Mother Jones. Retrieved 2015-12-24. ^ Burton, Clemency (2014-10-21). "Culture – Why aren't there more women conductors?". BBC. Retrieved 2015-12-24. ^ a b Blom 1954. ^ Michael Cooper (2015-06-13). "Ronald Wilford, Manager of Legendary Maestros, Dies at 87". The New York Times. Retrieved 2015-07-11. ^ Zachary Lewis (2009-03-24). "Cleveland Orchestra plans 'deep' cuts; Welser-Most takes pay cut". Cleveland Plain Dealer. Retrieved 2015-07-11. ^ Donna Perlmutter (2011-08-21). "He conducts himself well through crises". Los Angeles Times. Retrieved 2015-07-11. ^ Graydon Royce (2014-05-09). "Osmo Vänskä hires on to rebuild Minnesota Orchestra". Minneapolis Star-Tribune. Retrieved 2015-07-11. ^ John Eckhard, "Orchester ohne Dirigent", Neue Zeitschrift für Musik 158, no. 2 (1997): 40–43. ^ "Polytempo Music Articles". Greschak.com. Archived from the original on 2002-08-20. Retrieved 2014-06-04. Raynor, Henry (1978). The Orchestra: A History. Scribner. ISBN 978-0-684-15535-7. Sptizer, John, and Neil Zaslaw (2004). The Birth of the Orchestra: History of an Institution, 1650–1815. Oxford University Press. ISBN 978-0-19-816434-0. Wikimedia Commons has media related to Orchestras. Chisholm, Hugh, ed. (1911). "Orchestra" . Encyclopædia Britannica (11th ed.). Cambridge University Press.